Within the greater Catholic Church, CDR also oversees the relationship with the Pontifical Council Cor Unum, the Holy Father’s Developing World Outreach. 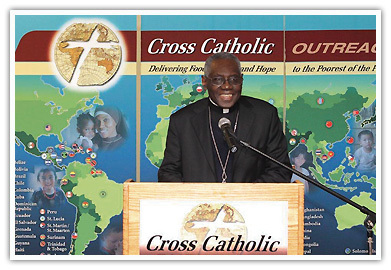 It is through these relationships that Cross Catholic Outreach develops a stronger relationship between the Church in the First World and the suffering Church in the Developing World and is better able to bring the two together in mutual assistance. By facilitating such a rapport, CDR enables Cross Catholic Outreach to be a significant part of the missionary work of the Catholic Church in the World today. Many countries remain difficult for most ministries to assist. Through our relationship with Cor Unum, Cross Catholic Outreach is able to help the Catholic Church in these places by channeling our aid through the Catholic Bishops in these countries through Cor Unum. Click here to learn more about our special relationship with Cor Unum.